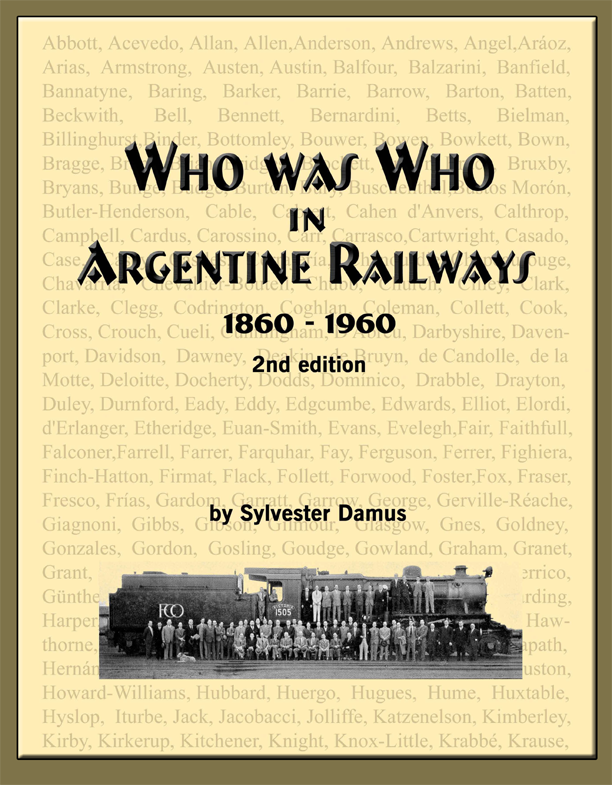 Who was Who in Argentine Railways by Sylvester Damus, 2nd edition. and civil engineers, station masters, engine drivers, etc. View sample pages. Both editions were reviewed. ISBN 978-1-55483-912-4. Hard cover, 8½ × 11; xvi+640 pages; weight: 2 kgs. Price: US$ 89.00 + postage. Postage: Air mail: US$51.00; surface mail: US$ 21.00. This 2nd edition is out of print. Please enquire about date of publication of the 3rd. In the interim, select files from this list and order by e-mail.